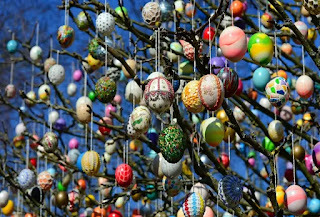 Easter Sunday is upon us and if you celebrate this holiday I hope you have a wonderful holiday and you're spending it with the ones you love. There were four days of school this week and I was able to work three of those days. We're off today for Good Friday. Next week I'm scheduled to work four days so far and I'm grateful as they are doing state testing and I don't normally work those days. Recently I bought a bottle of vegetable oil from Food City, but the bottle was leaking oil all over my pantry floor. For now I've put what didn't leak out into a glass jar to use. So I called the manufacturer to let them know what happened and they sent me three $2.00 off any of their products coupons. I'll be replacing the oil the next time I go to the store. We were able to get in on several free items this week. One of the items we received was a sample of Olay Luxe Lather Body wash. This item is foamy like shaving cream, which I thought I would like, but realized I prefer non foaming soap. We got in on a free drink from Speedway, which was an offer where you had to text Speedway and they sent you a link to the coupon. We both received a 22 ounce drink for free. We used it while we were out at yard sales on Saturday, and it was nice to have an ice cold refreshing drink. On Monday Kona Ice had a freebie, which we were going to pick up but didn't due to the time. We did pick up our free Hardee's biscuit on Monday though. They were delicious. I also received several orange juices this week from students who were going to throw them away. I think I got a total of five this week. We also received a free sample of Wild Zora freeze dried soup. I like the fact that this is freeze dried because it weighs so little, which makes it easy to carry in my sub bag. We stopped at the bread outlet one day and picked up two loaves of bread and one package of hot dog buns and one of hamburger buns. Total spent was $4.80. We also stopped at Food City and picked up two blocks of cheese, which were on sale for buy one get one free, which made them $2.00 each. We stopped in at Kroger on Thursday and picked up eggs for 69¢, milk for $1.39, bread for 38¢, cheese, and two marked down pizzas. We also went to JoAnn Fabrics where I was looking for something and had a 60% off coupon. But I realized I could get what I needed online in a bigger supply, so we left without buying anything. I received a survey in the mail from Consumer Opinion Institute and received $5 in cash for this. This is the $5 I used to buy the Breville Wok last weekend at the church rummage sale. Payday came early this week due to the Easter holiday, so I'll be paying bills and working on my budget today. I'm also doing laundry and processing. And I have chicken thawing for dinner. I'll be making a chicken stir fry in my new wok, and serving it with buttered rice. Right now it looks like yard sales will be rained out this week, unfortunately. How was your week? Any frugal finds? 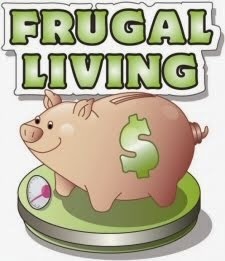 One of the frugal tips I read time and time again is one way to save money on your grocery bill is to only shop the perimeter of your grocery store. The theory here is that the food in the middle aisles of your grocery store are expensive, highly processed, and filled with artificial ingredients. The advice is that you will save money by by not buying these foods and only shopping the perimeter. My problem with this advice is that if you only shop the perimeter then you are missing out on some very frugal foods that will save you money. 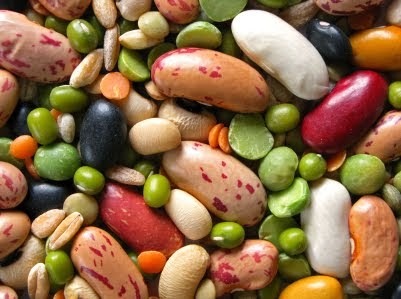 Foods like oatmeal, dried beans, rice, popcorn, canned tomatoes, pasta, etc., can only be found in the middle of the grocery store. 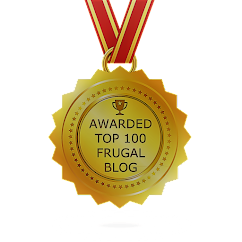 These frugal foods lie at the very foundation of a frugal lifestyle. 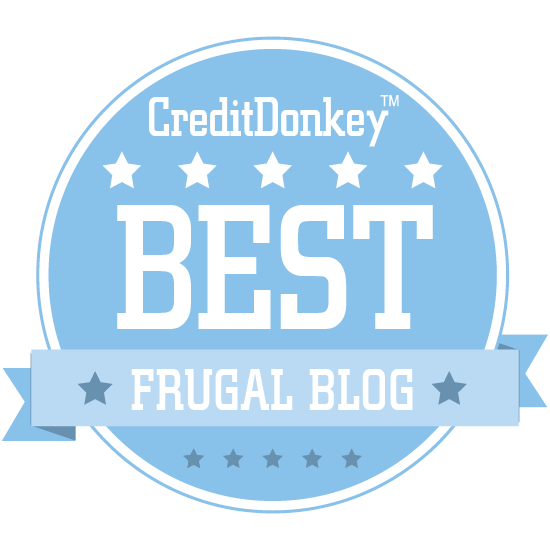 Taking these frugal foods items off the table would not be a wise financial move. Besides I enjoy going down the grocery store aisles to see items they have on markdown. If I didn't do that I might miss out on a good deal. Sluggy, over at Don't Read This; It's Boring, is having a giveaway for April. I've had the honor of winning one of her giveaways before and let me tell you she does not skimp on any of her giveaways. This month she is hosting two giveaways, one for people who have not won a giveaway from her, and one for people who have won a giveaway. Lucky me falls into the latter category. If you've never won a giveaway from Sluggy and would like to enter this one, here is a photo of what you'll win. There is a total of $60 worth of items in this giveaway and you can enter once each day. One way that I can earn an entry into the giveaway for old timers is to have someone go to this blog post and mention that I sent you there. 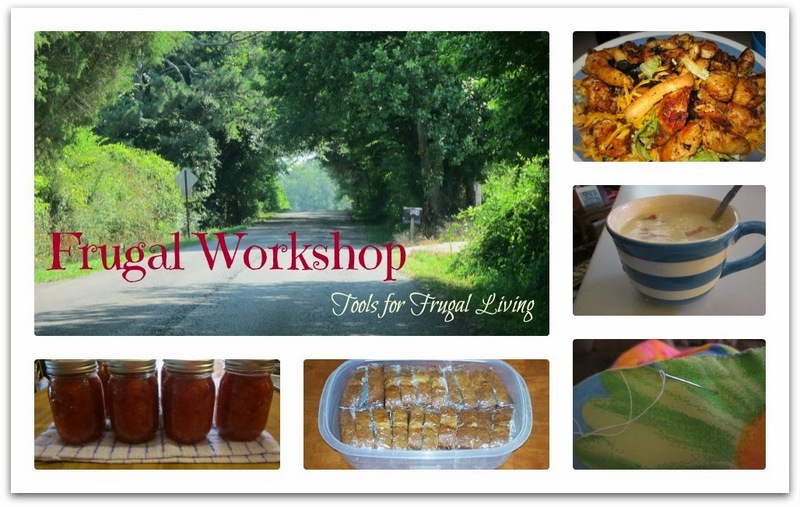 You can use my name Belinda at Frugal Workshop in the comment section. Then both you and I will earn an entry into the giveaway. On Saturday I woke up at four a.m. wide awake. So, I decided to make the best of it and got up and went ahead and made our lunches for the day. I cut up two cantaloupes, cut the granola bars I made Friday night, and made a couple of wraps to take with us. Unfortunately the rain ended up cutting the day short. My daughter only picked up 15 items this weekend and therefore didn't get enough inventory for the coming week. We did pick up a few things for ourselves though. On Thursday I had texted Bailey and told her if she found a sieve while thrifting or at a yard sale to get it for me. On Friday we found one at a yard sale for 25¢. We went to a couple of church rummage sales this weekend. I found two boxes of free clothing items at one and sorted through them and ended up taking one box with various items in it. We found a very nice, clean Insulated shopping bag for $1.00. We also found two plastic cereal containers for 10¢ each. And the best deal this weekend was a Breville Hot Wok Pro, which we found at one of the church rummage sales. They had $8 marked on it, but I asked them if they would take $5 and they did. I've been looking at woks for about a year now and when I saw this one I knew it was a very nice one. It sells for $129.99 on Amazon. I'm tickled to have found it and plan on having more stir frys in our meals in the future. 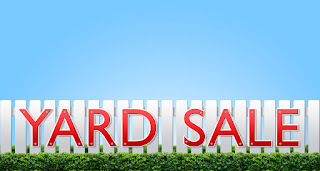 Any yard sales in your area this weekend? 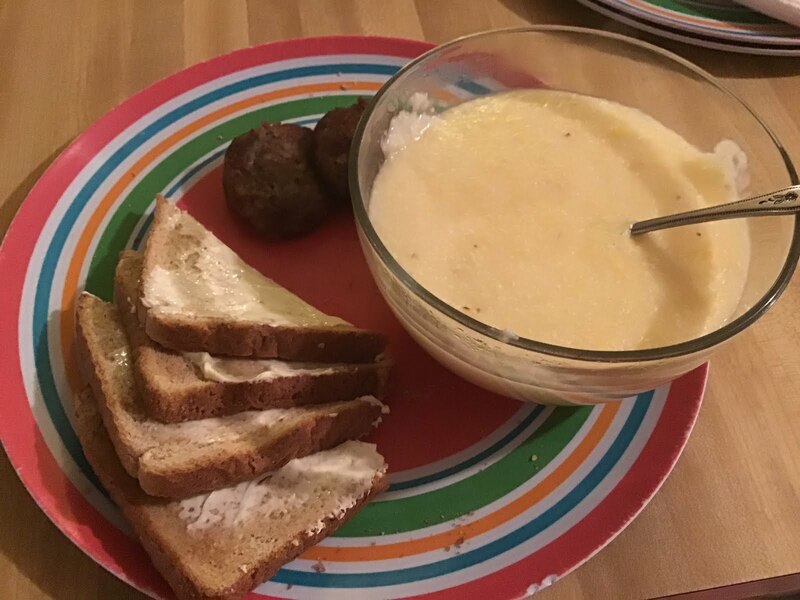 Breakfast this morning consisted of Cheese Grits, Sausage, Cantaloupe (not pictured), and Toast. Grits are very affordable and therefore make a great frugal food. Kroger regularly has this two pound bag on sale for 10 for $10.00, so $1.00 for two pounds of grits. 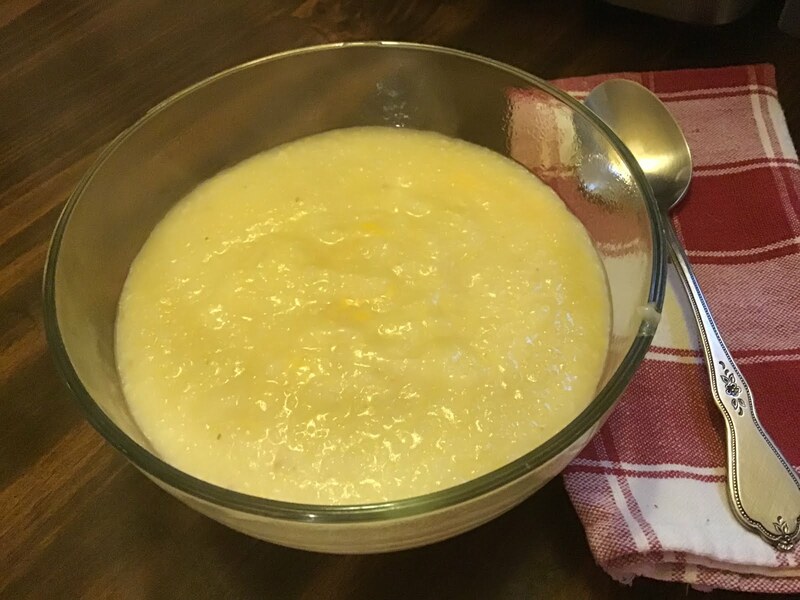 One serving of grits is 1/4 of a cup, which at this price costs about 5¢ per serving or what you see in this bowl. I made four servings, ate one and put three in the fridge for breakfasts later in the week. 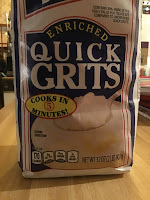 What I love about grits is they are very filling. It saves us money to eat foods low in cost and then we eat less of the more expensive foods like the sausage, which brings our overall total cost of breakfast lower. For dinner I decided to make some meatballs. I had several heels of bread in the freezer, so I started out by making bread crumbs out of them. I used about one cup's worth in the meatballs and put the rest of the bread crumbs in the freezer. The meatball recipe was just a basic one with one pound of ground beef, the bread crumbs, one egg, a small grated onion, salt pepper, worcestershire sauce, and garlic powder. I rolled them into balls and baked them at 350 degrees for 30 minutes. Dinner on Sunday was Meatballs, Acorn Squash, Green Beans with Onions, and Cantaloupe. On Monday I was called to sub at the last minute, which made me happy as I have car insurance due at the end of the month, so another day on my paycheck is always good. For breakfast I took one of the bowls of grits with me to eat when I got hungry. For dinner I wanted to make a chicken pot pie since I knew I had a can of chicken in the pantry, but I was going to have to make due with some other items. There was no pie crust, so I made one with flour & shortening. I didn't have any mixed vegetables, but I had a can of potatoes in the pantry and took the carrots out of a bag of frozen California blend vegetables. It tasted different from my ordinary Chicken Pot Pie, but Bailey loved it, so it worked. I also had red beans soaking from Sunday that I made in the Instant Pot. We didn't eat these today, but I wanted to make them for this week. I put them in the refrigerator for meals this week. Subbed again today, so I took a bowl of the cheese grits for breakfast when I got hungry. I also had cantaloupe that I brought with me. For lunch I packed a peanut butter & jelly sandwich, along with some carrots sticks and water to drink. Dinner was Little Smokies with BBQ sauce, Green Beans with Onions, Acorn Squash, and Rice and Cheese. I also had to make a fresh gallon of iced tea for dinner. I was called to sub at the last minute on Wednesday too. Breakfast was the last bowl of Cheese Grits that I made on Sunday and Cantaloupe. Lunch was pb&j. Dinner was the last of the Little Smokies with BBQ sauce and the last of the green beans with onions. The red beans I made earlier in the week came into play for dinner tonight. I ended up making chili for dinner tonight and there is plenty left over for dinner on Friday night too. This week, like last week, we've been using what we have on hand to make meals, so they may seem boring and/or repetitive to some readers. If you recall I had an added expense last month and needed to be careful with our funds for the time being. So you can say we are in "use it up mode", which can get pretty interesting at times. On Saturday I woke up at four a.m. wide awake. So, I decided to make the best of it and prepare the food we were taking with us to yard sales. I cut up two cantaloupes and put some in a smaller bowl for the road, cut the granola bars I made on Friday night, and made a couple of wraps to take with us. I also made a gallon of tea as the pitcher in the fridge only had about 1/3 left. For dinner when I get home I'm going to use the last of the chili and make Chili Tacos for dinner. This week I earned another $5.00 from Microsoft Rewards bringing my Amazon gift card balance to $15. This week I was scheduled to work two days, but ended up working four days. I'm grateful as there are only around 30 or so days of school left before summer vacation starts. On Tuesday I filled up my car and used my Exxon rewards card to earn points. Currently I have $6 worth of points on there and I'm saving those up to use one day when I want a free tank of gas. Today is laundry day and I already have the first of two loads washing. One way I save on laundry is having enough clothes to wear for two weeks. That way I only have to wash clothes every two weeks instead of every week and ensures I'm washing only full loads. Not using the washer every week definitely saves on the electric bill. 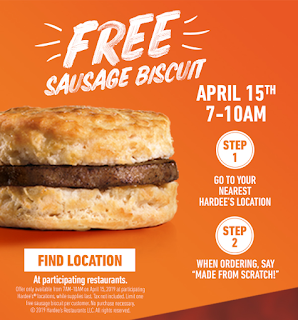 Hardees will be offering one free sausage biscuit to any customer who says while ordering, "Made from Scratch", April 15, 2019 from 7 to 10 a.m. 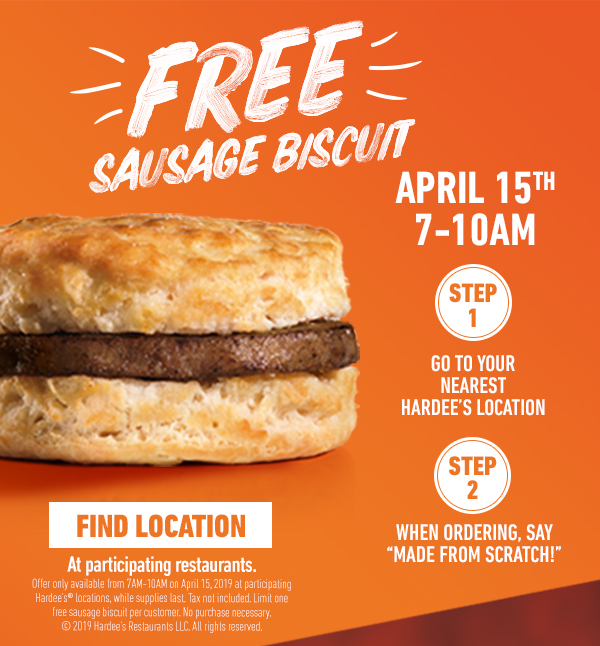 I'm not scheduled to work that day, but if I am I'll be sure to stop in to get a free biscuit. Speaking of breakfast food, one of the students gave me a free orange juice the other day at school. We also picked up two free water bottles at CVS this morning while we were picking up a prescription. We've been out and about this morning going to yard sales until the rain started. No worries, we will be heading back out tomorrow and then I'll write up a post about it soon. Slowly but surely the weather is warming up here and yard sale season is beginning. On Saturday we went to multiple yard sales and even two community yard sales. 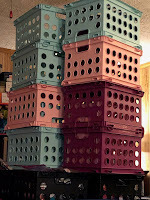 One of the other items we picked up at a yard sale were these bins. 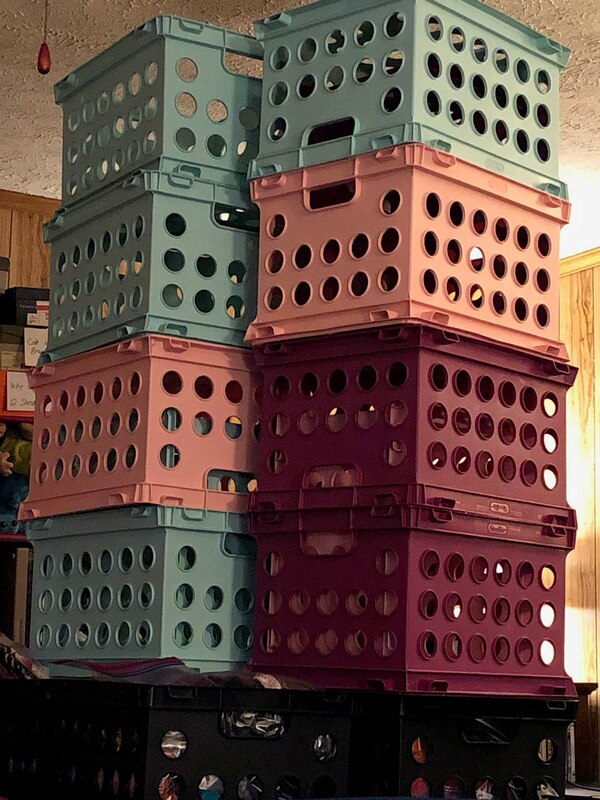 These are the bins my daughter uses to store her reselling items. She had been buying them at Sam's Club, but they've quit selling them. She found thirteen of these at a yard sale for $1.00 each and she was thrilled to find them. My daughter also picked up a diffuser for $1.00 yesterday, and although I didn't find anything for myself I did enjoy the thrill of the hunt. 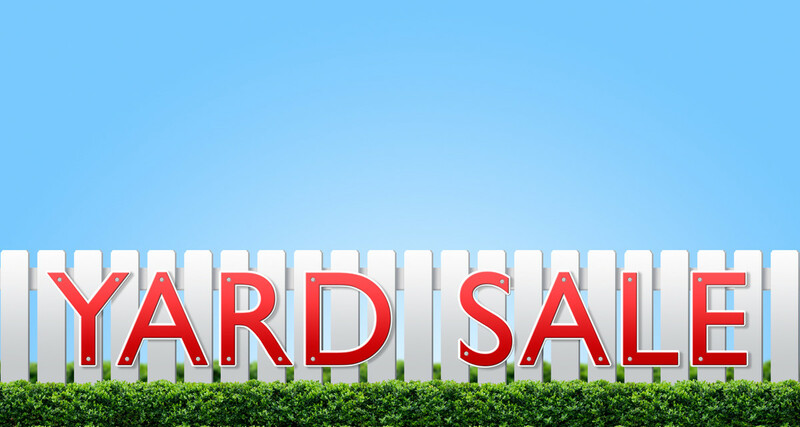 Have yard sales started up in your area yet?